Whenever we come to San Antonio we try and meet friends Larry,Pia,Charlie and Sandy for lunch. John first met them in the Air Force and has kept in touch over the years. On Tuesday we drove up to New Braunfels and had lunch with Larry and Pia at Huisache Restaurant. Would never guess that they are almost 80. Both are involved with rescue dogs and the training of them. They now have 5 in residence..all sizes and breeds. Pia always remembers Destiny with treats and inquiries. We have enjoyed their friendship over the years. On Wednesday I had Charlie and Sandy to the campground for lunch. 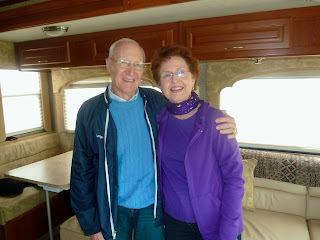 The weather turned cold,windy and rainy today so we couldn't eat outside, but that is OK as we were quite comfortable in the motorhome. I fixed green salad, fruit salad and rolled sliced sandwiches. A very healthy lunch. They live on a ranch in Ingram with a herd of goats and recently a baby antelope has taken up residence and has befriended the goats. Their friendship over the years has been enjoyed as well. Til next time dear friends, take care and stay in touch.